For this preparation 3 items are required. The Dosa batter [specifically for Davangere Benne Masala Dosa] ; The Aloo Curry for the filling and the Coconut Chutney. Soak Urad Dal and Dosa rice for 4-5 hrs and grind to a smooth paste. Grind the soaked beaten rice or poha and mix well and let it all come together and get the same consistency. Make sure its not very runny as the dosa batter needs to be firm but at the same time good enough to spread it easily on the tava. Please note i haven't added methi seeds which we generally add in dosa batters as i wanted to keep the whole dish white based. Let the batter ferment and rise. You could add a pinch of soda as well. Preferably set aside overnight. Mix the batter well and add salt to taste. Heat a pan and add about a tbsp cooking oil. Add a tsp of mustard and urad dal and let it crackle. Add the onions, curry leaves and chillies. Fry till translucent. You could sprinkle some water so that the onion doesn't change the color.. remember white is key for this dish! before onions caramelize and change color add the roughly mashed potatoes to the mixture and mix well. Add salt and mix. Turn off the heat and set aside to cool. Heat a "cast iron" or well seasoned "iron" skillet or tava and when its evenly heated till smoke appears, reduce the flame to medium and then pour a ladle full of batter and keep spreading the batter clockwise. Once the batter is spread, increase the flame to high and add a tsp of oil/ghee and let it cook. 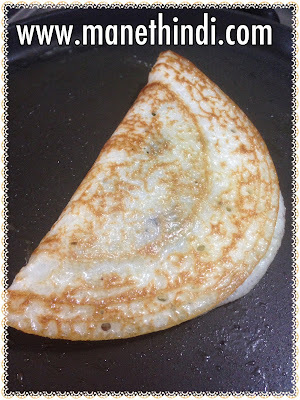 In this dosa recipe we dont flip it over and cook the other side as its done only on one side. the other side is let to get roasted as we work on the top part of the dosa. You can see holes appearing which is the sign of a well fermented batter. take a big scoop of the potato curry and place it in the middle. By this time the dosa would have cooked through. Fold the dosa to half and smear some butter on top. Serve piping hot with white coconut chutney! Thank you Ujjval! Please let us know the outcome :) and do chk our other recipes..happy cooking!